Despite the pre-match hopes the inevitability of another tame defeat at Goodison Park is visited on the Hammers. Well the green shoots of recovery that were seen last Friday didn’t survive very long and it is back to the drawing board and back to square one for David Moyes and the Hammers. Once again the attitude of the players, particularly in the first half, has been rightly criticised. Tails should have been well and truly up from a good second period against Leicester and after witnessing Everton’s troubles at Southampton. Fast out of the blocks and putting their players under immediate pressure from the off was what was required. As it was the hosts were allowed to play themselves into the game as West Ham sat back and took it easy. Surely, that could not have been the team orders, could it? If we thought we were rid of one Everton bogeyman in Lukaku then Rooney was afforded every opportunity to replace him as West Ham’s nemesis. Why does it so often need a half time bollocking to get any response from our players? It is far too early to lay the blame on the new manager but how long can we wait for signs of improvement if the worst nightmare is not to become reality? There were certainly reservations about the line-up. In the absence of Andy Carroll the decision to start with Andre Ayew as his replacement rather than Diafra Sakho was a strange one. Is Moyes falling in to the old West Ham manager trap of having a preferred list of players and selecting them in turn when an opening arises regardless of which position is vacant? Is it the lack of options that has bred complacency in the squad? Collectively the defence has looked weak all season and we continue not to provide enough defensive support from midfield. Right now we need at least two players in midfield whose priority is to defend. None of Obiang, Kouyate or Noble is good enough on their own and Kouyate seems to have a remit to get forward as much as possible increasing the fragility. The slow and ageing back-line needs far more support. Once again Joe Hart failed to impress and, if there was a chance to get back in the game at 2-0, it was scuppered by his dreadful attempt at a clearance that fell to Rooney’s feet. It is difficult to understand why Hart (especially as an on loan player) is preferred over Adrian. It has been apparent for some time that being the record signing at West Ham has resulted in little success for the players concerned. Andy, Andre and Arnie have all failed to impress in terms of both attitude and aptitude, and the winners in each of those deals has been the selling club. Their overall contribution has barely repaid the first instalments on the combined £50+ million transfer fees and whatever wages are involved. Player recruitment and the reliance on agents rather than scouting continues to blight the club. There was a welcome return to match-day action for that other A-man, Michail Antonio who is needed back at his sharpest and fittest without delay. Those of us around for the Roeder relegation season will remember the season’s oft-repeated lament of “if only Kanoute had scored that penalty against Arsenal”; if things continue as they are we might soon be hearing the regular refrain of “if only Antonio had taken the ball to the corner flag against Palace”. There has been a lot of debate about the penalties awarded in the game yesterday. It seems quite difficult to articulate what the exact law is nowadays but, within the current interpretation of what is and isn’t a penalty, it was no surprise that both were given by Michael Oliver. The danger is that this interpretation is moving football even further towards being a non-contact sport, particularly anywhere in the area, which is to the ultimate detriment of the game. Things look bad. The three games where points were meant to be available before the run of games against Manchester City, Chelsea and Arsenal have yielded just the one point. The return of points on games played to date would give us only 27 points if projected to the end of the season. It may seem obvious but, when looking for the likeliest relegation candidates, the teams with the worst goal difference are always at greatest risk; evidence as it is of problems at both ends of the pitch. At the moment West Ham, Palace and Huddersfield have the weakest goal differences and with the prospect of a double figure defeat at the weekend it might get a lot worse. For those interested in the record books we are closing in on Everton’s current position as having lost the most Premier League games since its foundation. We are just three defeats behind despite having played four fewer seasons. West Ham To Hammer The Toffees? It was a privilege to be at the London Stadium last Friday evening. Not for the quality of the football, although it was a small improvement on what we have previously seen this season. No, the reason was the energy and commitment of the players, which in turn led to the fans giving a demonstration of what backing a team is all about. The volume of support was right up there with what we heard in the games against Chelsea (EFL Cup) and Tottenham last season. The difference this time was that we weren’t actually winning the game. In some ways it was reminiscent of the infamous FA Cup semi-final against Nottingham Forest over a quarter of a century ago when Keith Hackett totally ruined a game of football, but the fans continued to support the team until the end. The only disappointment was that we couldn’t get a winning goal, but nevertheless the fans received plaudits from players, pundits and the media generally for the voluminous and continuous support. Now, can we please put an end to the stadium excuses and comments regarding lack of atmosphere? If the players demonstrate their commitment, then the fans will show theirs. Those of us who have been supporters for many years will accept losing games. What we won’t accept is heads going down when a goal is conceded, or lack of effort. As David Moyes has said, full commitment for 90 minutes should be the absolute minimum that players should give to a game. Too often in recent times that hasn’t been the case. It is still early days, and there is a long way to go, but I have to say that I have been very impressed with the start that our new manager and coaching staff have made. There was some ridiculous criticism of an appointment of a manger who, arguably, has been more successful (certainly in terms of league positions attained) than any other manager in our history. The players have been given a justifiable kick up the backside, so let us hope that the increased enthusiasm leads to some positive results, especially in view of the tough fixture list coming up. The game against the Toffees is one where both teams are considered to be in crisis, perhaps Everton even more surprisingly than ourselves. They were widely tipped to finish seventh in the Premier League and perhaps be challenging the dominance of the elite six. Quite clearly that hasn’t happened, Koeman was sacked around a month ago, and surprisingly they have left a caretaker (Unsworth) in charge. If anything their season has nosedived still further in the last month, and Moyes has said we are going into the game full of confidence. I have some reservations, partly because of our past record against teams who are in poor form, where somehow they seem to relish our visit which enables them to turn their form around. Beware a wounded toffeeman, he can be a dangerous beast! Wayne Rooney in particular has had a miserable return to his home town club, and a miserable few months off the pitch too. He has been left on the bench for the past couple of games, but somehow I can see him being picked for our visit and we all know what an impressive record he has when playing against us. But at least we haven’t got Lukaku to deal with this time! Everton actually began the season well with a 1-0 win against Stoke in the opener, followed by an even more impressive draw at Manchester City in their next match. They still remain the only team (with 13 games of the season gone) to have denied City a three point haul in a game. Of course City are our next opponents at the weekend, and if recent history is anything to go by then many will be dusting down their abacuses in readiness for our visit to the Etihad, but perhaps it is our time to turn the tables on a team in superb form? After the four points from their opening two games, Everton have only won twice more, 2-1 against Bournemouth, and an extremely fortuitous 3-2 victory over Watford (from 2-0 down). If you believe in sequences, then Everton seem to win a game, then fail to win in the next four. They won their first, sixth, and eleventh game of the season, so they are not due a victory until the sixteenth (this is game 14). But we are a good bet to help other teams break a sequence aren’t we? Once more our game is being televised, so I’ll settle down with my Everton mints and hope that we can get at them as soon as the Z-Cars theme is over. An early goal from us would hopefully get the home crowd on the backs of their players. The Merseyside natives are getting restless with the performances of their team in recent games, so let us hope they don’t choose to up their game for this one, as they have frequently done in the past few seasons against us. At the time of writing this article they still haven’t appointed a permanent manager, but our old friend Big Sam is widely tipped to be taking over the reins there. Their search is now even more urgent after their poor performance in a 4-1 defeat at Southampton at the weekend. As with all West Ham games this is a difficult one to call, and despite their indifferent form, the bookmakers still have Everton as firm favourites to win the match. Historically they have a far superior record in games against us with 68 wins in 136 matches, and we have only beaten them once in the league (either home or away) in the last ten years (3-2 at Goodison in 2016, after coming back from two down). Perhaps it is now our turn to break our sequence of poor results against them? Will It Be A Black Friday For West Ham Against Leicester? After being stung in the Hornets nest, West Ham go Foxhunting. But will it be a Black Friday night? Leicester City, the most unlikely 5000-1 winners of the Premier League just over a season ago are the next visitors to the London Stadium in the first game of the weekend on Friday night. This is their fourth consecutive season in the top flight and their 50th in their history, compared to our 60. They returned after a period of ten years out in 2014-15, and struggled throughout that season. With 29 games played they had amassed just 19 points and were seven points adrift of safety. They looked odds-on to return to the Championship, but with Nigel Pearson at the helm they won seven of their last nine games to finish on a respectable 41 points in 14th position, just two places below us. Early in that season we had beaten them 2-0 at Upton Park with goals from Carroll and Downing, but we were the losers in the return, which was one of their seven wins in the run-in, going down 2-1 with Kouyate scoring our goal. The following season was the stuff of fairy tales and has been written about at length. Suffice to say we will probably have to wait another 5000 years for a repeat. Pearson had been sacked and Ranieri took over to mastermind one of the most astonishing stories in the history of football. 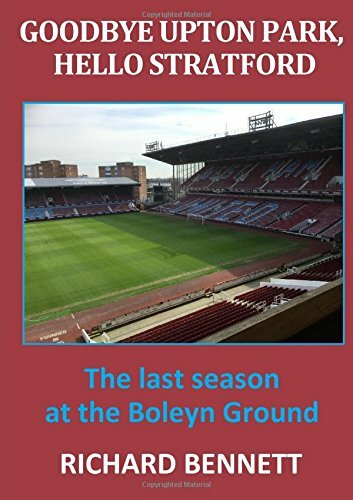 They beat us 2-1 at Upton Park in our first home game of the final season there (a Frenchman scored our goal), but we were unlucky in the return at their place near the end of the season, when leading 2-1 in the 95th minute we failed to retain possession of the ball (just for a change!!) and then Carroll conceded what to most observers was a dubious penalty decision, and we ended with a draw. Carroll and Cresswell were our scorers that day. Last season (2016-17) they came back down to earth and eventually finished in 12th place (we finished 11th). Ranieri was sacked in February after five consecutive defeats, and replaced by Shakespeare, who began his tenure with five straight wins, although four of them were home games, and Hull, Stoke, Sunderland and ourselves were not the most demanding of opponents. They did the double over us winning 1-0 at their place, and 3-2 at the London Stadium, where goals from Lanzini and Ayew were not enough to complete an unlikely comeback in a 3-2 defeat. They did perform exceptionally well in the Champions League, before just going out at the quarter-final stage to Atletico Madrid. This season, after a poor start winning just one of their first eight games, the Bard himself was sacked and they now have Claude Puel in charge. They have since picked up a creditable 7 points from their last four games and now sit 12th in the table on 13 points, winning 3, drawing 4 and losing 5 of their 12 games. This puts them out of our reach even if we can manage a victory in this game, but we desperately need to win the match to ensure that we don’t fall further behind in the relegation scrap at the foot of the table. Their away record comprises a win at Swansea, draws at Huddersfield, Bournemouth and Stoke, and defeats at Arsenal and Manchester United. So many of our players had poor games at Watford that it hard to second guess the team that Moyes will select to try to achieve what would be an important win. One player who did do himself justice was Masuaku who had a fine 20 minute cameo, and I would like to see him selected in a more advanced role than full back. He showed an ability to take on and beat opponents as well as putting in decent crosses. I’d like to see Sakho and possibly Martinez start up front to give us greater mobility in that position, which would mean no place for Carroll who can be a potential liability. Lanzini needs to have a central role to be effective, not stuck out on the left. I hope that Rice enters the manager’s plans, perhaps filling a defensive midfield role protecting the defence, possibly alongside Obiang who has not been at his best recently, but in my view would be preferable to Noble and Kouyate. When I looked at the bookmakers’ odds for the game, both Leicester and ourselves are currently priced at around 17/10 to win the game, with 23/10 on the draw. Surely we can’t play as badly again as we did at Watford where we were totally outclassed, yet could have possibly scored four goals from clear-cut chances. I would like to think that Hernandez would have made much more of the goalscoring opportunities that fell to Kouyate (twice), Arnautavic and Lanzini, although Gomes did pull off one tremendous double save. The statistics from the Watford game apparently show that collectively, West Ham players covered more ground than in any other league game this season. But that alone is quite clearly not the answer, and Moyes and his coaching team will have had to work hard this week to try to ensure an improved performance for this game. The atmosphere has been described as “toxic” around the club, and I hate to imagine the reaction if we concede the first goal in the game. Scoring first would give everyone a lift, and that is what we must hope for. Following a shambolic managerial debut can Moyes rally the troops in his first game at the London Stadium? Right now it is difficult to see how things could get any worse at West Ham but tonight we have another opportunity to find out if it is possible. If everything we read is to be believed supporters, players, management, in-the-know bloggers and probably even Doris the tea lady are verbally slugging it out with each other and amongst themselves. Have the Hammers reached their darkest hour or will there be the faintest glimmer of light to sustain us over the weekend. Unity has been called for but appears a distant, forlorn hope at the moment and it won’t need much more than a slow, nervy start for the Friday night London Stadium atmosphere to descend to an all too familiar toxicity. Towards the end of the 2014/15 season, West Ham visited the King Power stadium with Leicester languishing at the foot of the table and looking odds-on for relegation. The Foxes famously won, their first victory in nine, and went on to record seven more wins in their last nine games to preserve their Premier League status. The following season they were Champions. Can history repeat itself but in reverse? Yes, I was only joking ……… but taking something from the game, if not quite essential for survival, would be a major lift before that dreadful run of fixtures in December. Leicester were never going to repeat their heroics of the 2015/16 season as most teams, with the exception of West Ham, got wise to the primary tactic of the ball over the top for Vardy to chase. They did well to keep the majority of that squad together (despite losing the influential Kante and later Drinkwater) but what appeared to be a productive transfer window last summer has yet to bear fruit as they hover around mid-table (but only four points better than ourselves). It is a surprise that they have already changed managers twice since their dream season and also that they saw enough quality in Claude Puel to bring him in as Shakespeare’s replacement. Puel’s previous Southampton side did, of course, stroll to a 3-0 victory at the London Stadium in September last year. West Ham’s record against Leicester goes back to 1919 and stands evenly balanced with the Hammers having won fifty-one, lost forty-eight with thirty drawn games. In the last twelve encounters West Ham have won four and lost five. Leicester are looking for a hat-trick of straight wins against the Hammers in London despite West Ham having won eight of the last twelve home clashes. It appears that Marko Arnautovic has miraculously recovered from the near death sore thumb trauma and is available for selection along with Andre Ayew who has shaken off his illness. According to reports Michail Antonio, Javier Hernandez, James Collins and Sam Byram are all still out. Changes are certainly required from the team that failed to impress at Watford; not just because almost every player was hopeless but also because the team was so unbalanced. I would like to see Arthur Masuaku start but in a midfield role as he and Aaron Cresswell would prove a handful on the left hand side. Maybe give Arnautovic another run out on the right with Manuel Lanzini moving to an attacking central midfield role where he is best suited and can cause more damage. That would leave a choice of two out of Noble/ Obiang and Kouyate in the centre of midfield. In the striker role I would like to see Diafra Sakho start in preference to Andy Carroll and would also prefer to see Adrian between the sticks. Defensive options look to be limited (I am assuming that Moyes will stick with a back four) and it is unlikely that he will be brave enough to give a start to Declan Rice – I am not convinced that Rice is the answer to the midfield frailties. Leicester have no injury concerns other than the continued absence of the Neanderthal Robert Huth. The main threats will continue to come from the Vardy/ Mahrez combination but hopefully we will at last have woken up to the ball over the top of the defence tactic. The other concern is a reckless Ogbonna tackle on Vardy in the area to concede a needless penalty. Today sees Martin Atkinson of West Yorkshire take charge of his third West Ham game of the season having previously officiated in defeats away at Manchester United and at home to Brighton. Will he finally get to award a West Ham goal? In eight games this season he has shown nineteen yellows and one red cards. Lawro from the BBC sees this as a 1-1 draw while Sky’s Merson predicts a sound 1-3 away win. It will be interesting to see how West Ham approach this game. They badly need something from it and cannot afford a slow and ponderous backwards-sideways start if they want to keep the crowd on side. Will they have finally learned how to stop Vardy exploiting space behind the central defenders? Can they keep the ball long enough to put any sustained pressure on the Leicester defence? Moyes will not want to lose but cannot afford to set up not to lose as he did at Watford. Puel seems to be from the same unadventurous school of football management. It could be a cagey game but as always a goal can change everything. It has the look of low scoring draw about it to me.